Use store bought pizza dough for a quick, easy meal. These are a real treat! 1. Preheat oven to 375°F. Roll, press, and stretch the dough into an 8-by-10-inch rectangle. Starting along the short edge and using a sharp knife, slice the dough into eight 3/4-inch-wide lengths. 2. Whisk together the sugar and cinnamon in a shallow dish. 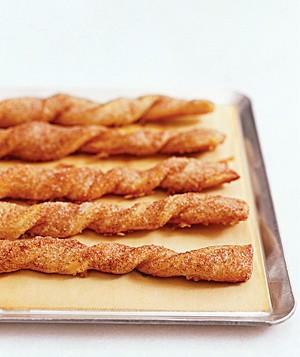 Brush all sides with melted butter and roll in cinnamon sugar. Twist the ends in opposite directions, then transfer to a greased or parchment-lined baking sheet. 3. Let rest 10 minutes. Bake 18 to 20 minutes.